I’ve decided that I’m going to start posting chancery records. They are invaluable sources of information. My mother is the queen of finding land records, so all thanks should be directed to her. 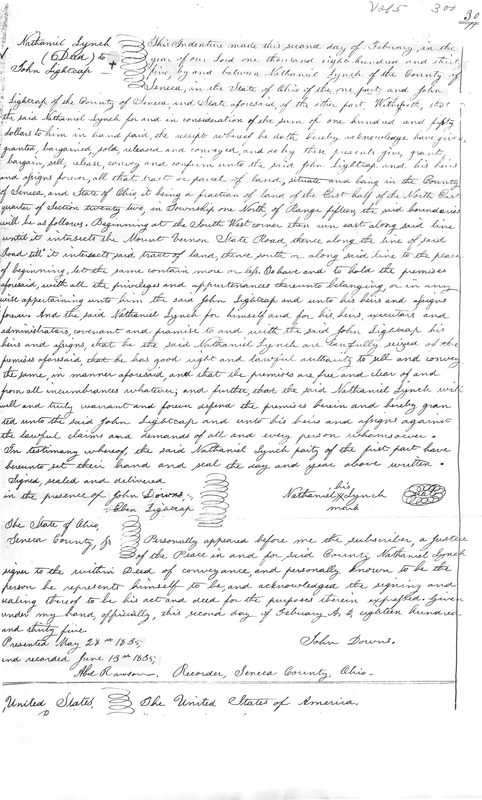 This is the chancery record that Nathaniel Lynch deeded to John Lightcap, “the East half of the North Part quarter of Section twenty two, in Township one North, of Range fifteen” in Seneca County, Ohio. Recorded June 13, 1835. John Lightcap was my gggg-grandfather. I usually try to transcribe the records that I post. However, figuring out the handwriting on chancery records and typing it out takes a lot of time. So, happy reading!